The out of the box feature set for managing multi-sites in Sitecore is quite impressive these days. For the first time I recently looked at setting up Locally Managed Domains so that I could create Sitecore users that only have access to users within one or more Sitecore domains. It took a bit of trial and error but it ended up being really easy in the end. 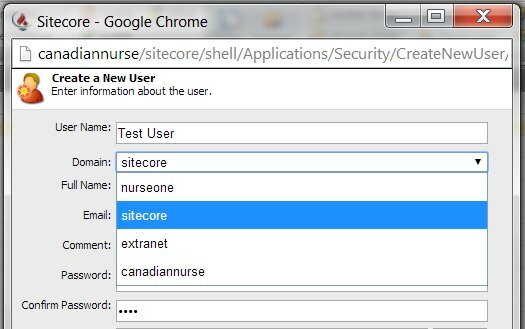 Thanks Sitecore! A common multi-site set up can have lots of different types of users. For instance, you will definitely have Sitecore admins and content authors who belong to the Sitecore domain. On top of that you may have other users that belong to the Extranet domain or custom domains that you have created. In my situation I had a Sitecore instance that was hosting 3 unique sites and each site had a corresponding Sitecore domain that was used to hold users for that specific site. Since all 3 sites are managed independently by different departments, a requirement was that each department should only be able to see and manage users that belong to their specific website. Fair enough. What this really means is that when someone opens the Sitecore User Manager, they should see a subset of users instead of the default which lists all users across all domains. 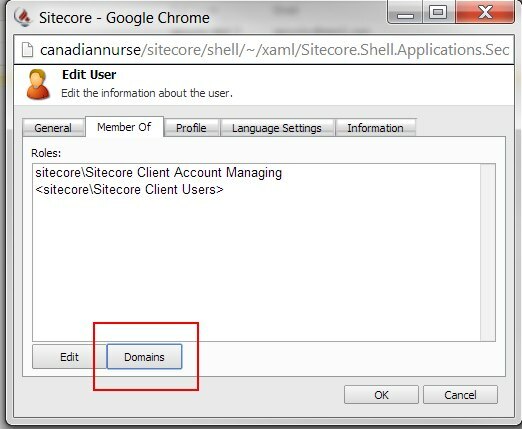 Open up the Sitecore Domain Manager tool and either create a new domain or edit an existing domain. Either way you can select the Locally Managed Domain checkbox. 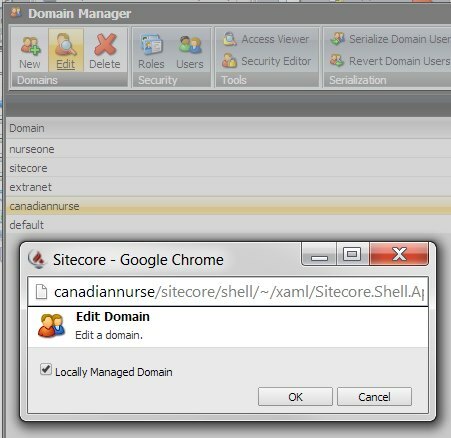 Locally managed domains are set-up on a per user basis so let’s create a new user that belongs to the Sitecore domain. 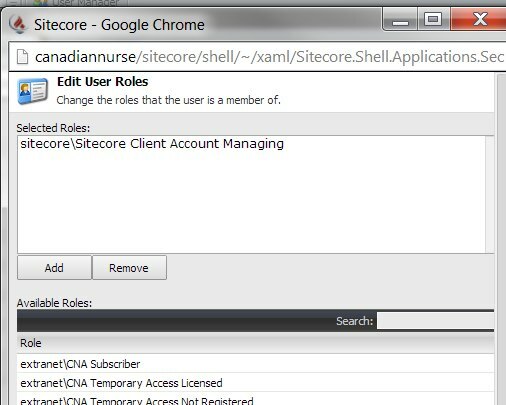 In order for this new user to have access to the User Manager tool in the Sitecore client, we need add the sitecore\Sitecore Client Account Managing role to our new user. Next, finish creating your new user. After that we can finally set which domains this new user has access to! Double click on your new user or select Edit from the top ribbon. Navigate to the Member Of tab and click on the Domains button as seen below. This will open up the Edit Managed Domains dialog box which allows you to set the access rights for individual domains for this user. Each user can have access to one or more individual domains. 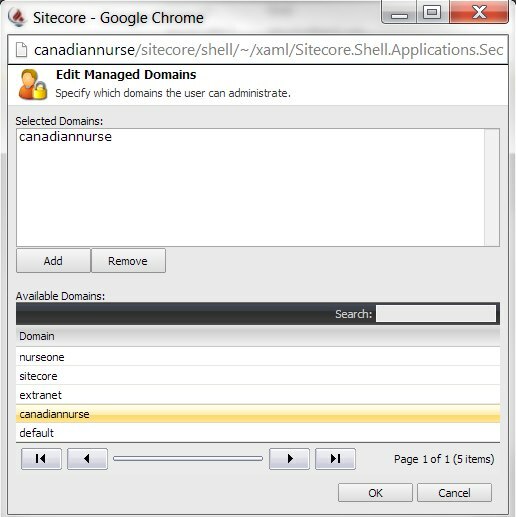 In the example above I selected the canadiannurse domain which means that our new user will only see users associated with that particular domain when they open the Sitecore User Manager.